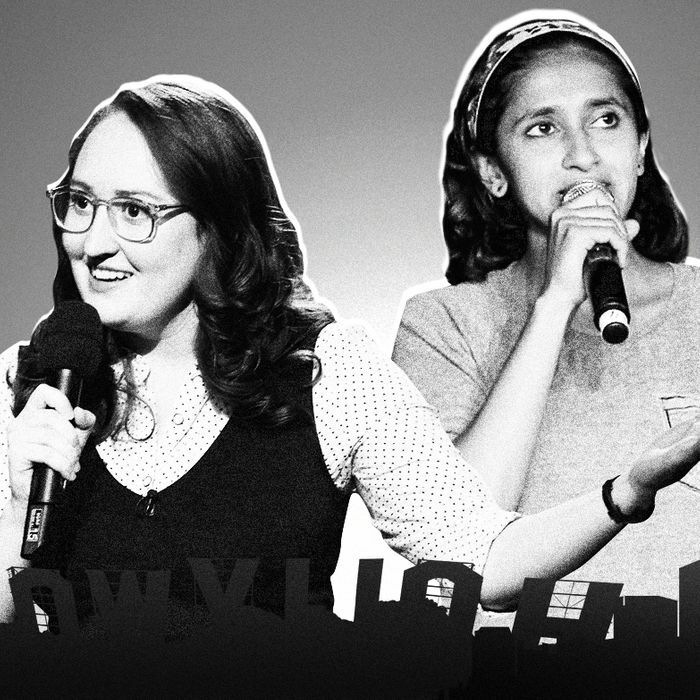 Emily Heller Talks to Aparna Nancherla About Whether It’s Better to Do Stand-up in NYC or L.A. This week, Vulture is running a series of stories about the comedy produced in, and inspired by, New York and Los Angeles. On Monday, comedian Chris Gethard wrote about his decision to stay in New York City. On Tuesday, we had guides for comedy fans looking to see comedy in both NYC and L.A. Today, we hear from a pair of comics about the audiences in each city. Knowing of their similar yet opposite experiences, we felt they’d be perfect to discuss exactly what it’s like performing stand-up in each city. The two discuss the ways that audiences differ, how conducive the cities are for writing jokes, and ultimately agree upon which town is more enjoyable to perform in. Emily Heller: Hey, Aparna. How are you? Aparna Nancherla: It’s so cold today. The differences are starting already. I’m wearing shorts. Oh boy, yeah, we’re in different places. Let’s get into it. I don’t know about you, but in my experience, the audiences at shows in New York feel like what audiences in the rest of the country feel like — which is, people who don’t go to comedy shows all the time. They’re off from work and want to have fun. Whereas in L.A., that’s sometimes true, but then there are also lots of industry people. Not to say I’m not so grateful for the people in L.A. who just go to comedy shows all the time, but it’s not the same. You’re not getting crowds off the streets. In New York you have comedy fans, but they aren’t in comedy. They have no interest in doing it. “There’s a show in my neighborhood, and it’s a good, fun thing to do after work on Mondays,” or whatever. Yeah, I love that. In New York, no one’s in a rush to get home. Right, it’s a huge go-out-and-booze culture that’s more enabled by public transit, et cetera. And just places being open. Yes, totally. I also feel like this conversation is already in the territory of people-have-talked-about-this. We are covering the classics. I will say that in terms of cities to perform stand-up in, I do prefer New York. I miss it. I didn’t like everything about living there, but the stand-up opportunities, and the palpable level of work that everyone around you was putting into their jokes … In L.A., I’m more aware of the TV projects my comedian friends have going than their joke-crafting. Man, if anyone in New York wants to get a free drink, they should just chat up a comedian at a show, because we’re not using all of our drink tickets. I have so many in my pockets that I don’t even know where they’re from. But going back to what you were saying, New York is a struggle to live in — no contest compared to Los Angeles and many other places — but what it gives back is that energy and excitement that audiences have genuinely about seeing stand-up. People make a lot of how many shows you can do per night in New York versus L.A., and I’m not saying anything new by reiterating that, but it really matters. If you have a new joke you’re working on in New York, you can do it three times in a night, and by the end of the night, it’s good. In L.A., you have to work so hard to do that many shows in a night. This is just me projecting, too, because I have a day job working in TV. I’m really grateful for it, but it means I’m not dying to do a bunch of sets in one night. It takes me longer to get a new bit in shape. And if I don’t have a new bit that I’m excited about — and I don’t get excited about them unless they start working — it means I have less incentive to want to perform. What I’m saying, then, is that as a lazy person, New York was better suited to my work ethic. Though I’m not someone who does seven or eight sets a night, or however many people do. The record is probably 200, or something. It’s not something I can fathom. Oh yeah, it’s the same people. I don’t know if I’m getting any helpful feedback at that point. I was happy living in New York and I’m happy living in L.A., but I was also uncomfortable in New York, and that lends itself to better jokes. My material was better by virtue of the fact that I was sharing a lot of uncomfortable experiences with the people who were going to be in my audience. Obviously, it would be different if I were here and unemployed and temping, the way I was in New York. Still, I drive everywhere alone. I don’t feel like I have as much discomfort to tap into for my comedy — what an amazing complaint to be able to make — but it does make me feel like there’s a little bit less going on underneath the surface. That’s so funny, because when I lived in L.A., I was on that side of the equation — I was temping and then doing shows at night. But despite feeling frustrated with my career or not being sure what was on the horizon, I didn’t necessarily feel like it fueled my creativity. It’s still sunny every day, and you can just go to meet your friend and add avocado to anything. It’s hard to be angsty when you have fresh produce. You can be rich and successful and happy in New York, and still someone could spit in your face any day of the week. You’re never going to run out of disgust for humanity. If your only grievance in L.A. is you’re not rich and famous yet, I can’t think of anyone who would empathize with you. Yeah, and that translates into people’s material, too. Another thing — for a little over a year now, I’ve been running a show [Fresh Out!] in L.A. that I used to do in New York. And the difference in audience when we have a famous person versus when we don’t is huge. I don’t know if New York is like that just because there aren’t as many Patton Oswalts out there, but if you had, say, Jim Gaffigan booked on your show in New York and he dropped out, it didn’t feel like the audience would be as bummed. They’re not there for celebrities; they’re there for comedy. If I have someone booked on my show in L.A. and they drop out, it feels like I really let the audience down. And as a comedian on those shows, I definitely feels at times like, They are waiting for Patton Oswalt to come out. Because there’s a higher chance of that happening there. I’ve been hosting [the long-running stand-up show] Whiplash for a year now, and I would say that’s a show where there’s a high proportion of famous drop-ins. The lineup is never preannounced, however, so it’s almost the best of both worlds, because the audience comes hoping for that but it’s never promised. When it happens, it’s amazing, they lose their minds, but first and foremost, they’re there to see a great show. Absolutely. Though, obviously, 100 percent of everything I’m saying about both cities is me projecting my own insecurities about whether or not an audience wants to hear me talk. No, but I felt that when I was in L.A. There is a certain star factor that audiences there are used to. I don’t know what it is, but there’s more value placed on that. It’s partially that, but then the jaded part of me is like, in L.A., you can be seen at any time by someone who’s watching. I feel like even audience members feel like they’re being scouted as audience members. Oh, that really tickles me. Aparna Nancherla has a new podcast with comedian Jacqueline Novak called Blue Woman Group available on Howl. Emily Heller’s debut album Good for Her is available now on Kill Rock Stars. Is It Better to Perform Stand-up in NYC or L.A.?